Serving Wallingford, East Wallingford, Quinnipiac, Tracy, Wallingford Center, and Yalesville. If you’re looking for a carpet and floor cleaning service in Wallingford, Connecticut, look no further than Always Clean, LLC. At Always Clean, LLC our first priority is always your satisfaction and comfort. That means we pay attention to every detail, making sure your carpets, rugs, wood floors, and every other surface are immaculate. Learn more about our services below. At Always Clean, we begin our Wallingford carpet cleaning services with a free inspection. From there, we can provide a quote and get down to cleaning. The most common method we use is is with hot water extraction, more popularly known as steam cleaning. We also offer a 14-day money back guarantee on all of our carpet cleaning services! Area rugs, especially Oriental rugs, add incomparable style and class to any room. But without proper care they can wear out prematurely, fade, and generally not look their best. 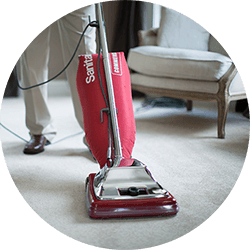 Our oriental and area rug cleaning services are done in your home or in our in-house cleaning shop, depending on your preferences. 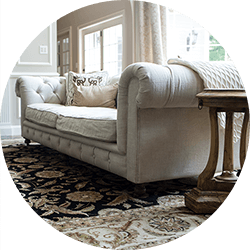 In either case, we inspect, pre-condition, spot, wash, and dry your rug with peerless quality and attention to detail. Furniture, drapes, and other upholstery require special consideration when cleaning. That’s why we pre-inspect, vacuum, condition, and rinse every piece we clean with extra care. Our technicians have been trained and certified in the proper techniques to use to clean your upholstery. We can “wet” clean or “dry” clean, depending on the method needed or recommended by the manufacturer. Hardwood floors are popular in many of the classic homes that are popular in Wallingford, CT and surrounding communities. Always Clean, LLC’s professional hardwood floor cleaning is a fast, affordable way to take care of your wood floors without the need for re-sanding.